Jackie Lackey, Director of Strategic Marketing; Kristi Stevens, Marketing Project Manager; and Tell Stevens, Digital Marketing Manager, are based out of an office in Haskell, Texas. Jamie Beatty, Senior Graphic Designer, works from her home in Indiana, Pennsylvania. In her role as Director of Strategic Marketing, Jackie Lackey will identify opportunities and coordinate marketing efforts across all platforms. She brings more than a decade of marketing and communication experience having founded her own marketing and public relations company, Encore Visions, while in graduate school at Texas A&M University, where she earned a master’s in Agribusiness and a bachelor’s in Animal Science. 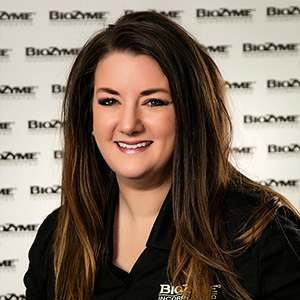 Lackey and her Encore Visions staff have worked on a contract basis with BioZyme for several years, and as BioZyme’s business grew, so did the demand for marketing and communications efforts. After several conversations with Lisa and Bob Norton and the Encore staff, it was clear that this was a perfect fit for all parties. Lackey and her husband, Jason, also own and operate Lackey Livestock, where they raise and sell show pigs. They have two sons, Weston, 8, and Grant, 6. Lackey said she finds her joy in working alongside Jason raising their boys in agriculture and helping and supporting Jason with his passion. Kristi Stevens uses her marketing skills and business savvy as the Marketing Project Manager. She manages the many internal and external communications pieces for BioZyme while planning programs and events. She showed sheep and goats through FFA in high school at Waxahachie, Texas, which led her to pursue a degree in Animal Science from Texas A&M. 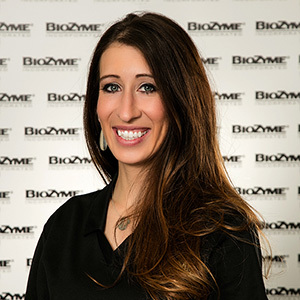 Prior to joining BioZyme, she worked for Encore Visions, managing multiple projects for multiple clients. Stevens and her husband, Tell, have two children, Addison, 4, and Tylan, 1. She enjoys reading and sharing a love of books with her kids. Tell Stevens is the Digital Marketing Manager and will oversee the front-end of all the public websites, digital advertising, email marketing efforts, manage contacts and sales leads, and manage the analytics of the digital efforts. He is a self-taught web developer who also had worked at Encore Visions. Tell grew up showing steers, lambs and pigs. He also earned a bachelor’s degree in Animal Science from Texas A&M. During and immediately after graduation, he worked at GRI/ Sexing Technologies. He and his dad are on a competition barbecue team, and he also enjoys woodworking. 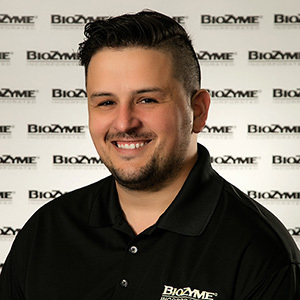 As Senior Graphic Designer, Jamie Beatty will create the images that brand BioZyme products for the public. She will develop advertising and promotional pieces that creatively convey a message that resonates with consumers. She has a degree in Agricultural Communications and Animal Science from The Ohio State University. She has served as the Director of Communications for the Ohio Pork Producers Council and worked at Encore Visions since 2009. “I am really excited to promote the products we offer,” Beatty said. She added that she and her husband use the BioZyme products on their club lamb operation, where they have 150 ewes and produce lambs for 4-H and FFA projects. She has 2 1/2-year-old son, Stetson, who keeps her busy. She also enjoys helping young kids with their livestock projects. 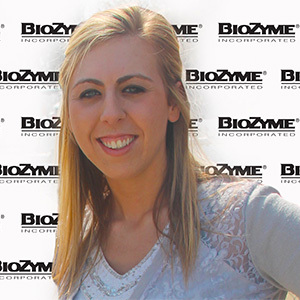 For a complete list of the BioZyme squad, visit http://biozymeinc.com/our-staff.